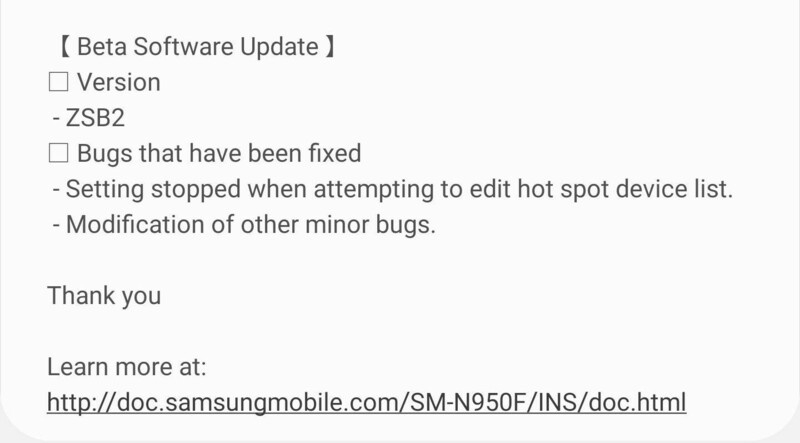 Samsung has been testing Android 9 Pie beta on the Galaxy Note 8 since January 2019 and with the latest update, it marks the fourth firmware the device has received during this beta program. The latest update is rolling out as version N950FXXU5ZSB2, up from build ZSB1 that came out last week with several bug fixes and February 2019 security patch. The new update still carries the same patch level and weighs 580MB, suggesting there is something it brings to the table. And true to this, the changelog says build ZSB2 fixes an issue where settings stopped when attempting to edit hotspot device list. As usual, the same update also irons out any other issues discovered in beta 3 as the company looks increasingly ready to begin rolling out the stable version. Samsung says you need to have installed beta 3 before grabbing the latest beta 4 for convenient and continued safe use of your Note 8. Also, since the update could cause errors to your device, be sure to back up your data before downloading beta 4. Galaxy Note 8 users who are already testing Android Pie beta should begin seeing OTA download notifications arriving anytime from now. If the update hasn’t arrived, you can force your device to check for it via Settings > Software update > Software manual update.